With a degree in Studio Arts this creative California babe enjoys thrift shopping and "researching" HGTV for the best interior styling tips. We might add that Kamryn has a definite sweet tooth. She is looking to discover the best tasting pastry and says it is exhausting trying every flavor macaroon! Her favorite moment in a wedding is when the father-daughter dance takes place, what a tender tradition. Kamryn could not fit in better with this group! Get a taste of Kamryn's style with this Auntie Mame inspiration board. 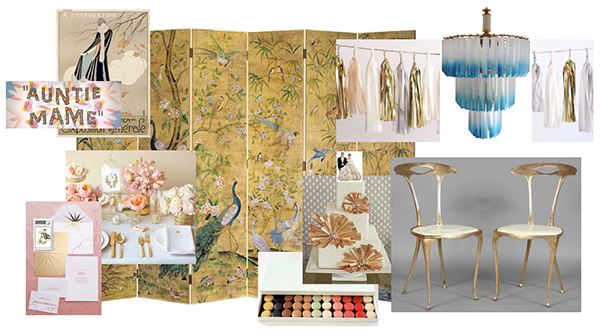 When Heather asked to create an inspiration board, I immediately thought of the 1958 movie, Auntie Mame. I had seen it during a course I took this summer which focused on fashion illustration, but as soon as little Patrick entered his Auntie Mame's house, I couldn't take my eyes off the ever evolving interior decor - including the beautiful chandelier. The opening scene takes place in the 1920s and the decor includes references to chinoiserie, art nouveau, and art deco. I knew those influences would make a beautiful wedding! Q: Scary movies or happy endings? A: Happy or sad endings, but never scary! A: I'm kind of an awkward hugger - I never know when it's appropriate. Luckily, hugging your husband is never weird, so I do that a lot! A: I think it depends on where you live. Spending the last 2 years in Phoenix made me a winter lover. Q: Deep down what do you really want to be? A: I want to learn how to do so many things, but at the end of the day, I really want to be a set designer. I mean everyone can identify that old, rusty-orange colored couch (Friends). How neat would it be to choose those iconic pieces?! I love that interior spaces, whether on a set or in reality, tell the story of the inhabitants - there's a wonderful amount of anthropology and psychology in it. A: The Volcano Candle from Anthropologie, little babies, and a fresh French baguette top my list. Q: What is your favorite flower? A: Queen Anne's Lace - so unassuming and lovely. Q: Backpacking or luxury hotel? A: Can I choose a Bed and Breakfast? A: Cake - but I would eat the pie too! That is one cute intern! !